Anubis has used a mind probe on Jonas, and has learned of the existence of naquadria on Jonas's homeworld. The Kelownans contact the SGC with word that Anubis's mothership is hovering above their capital, and the destruction of their world has begun. O'Neill and Carter meet Ambassador Dreylock and Commander Hale in an underground bunker beneath Kelowna, and they agree to offer assistance only with the cooperation of the planet's three major powers. Meanwhile, Teal'c remains a prisoner of Lord Yu, but he convinces Yu's First Prime, Oshu, to seek the cooperation of Ba'al to lead the System Lords against Anubis. Aboard Anubis's mothership, Daniel locates Jonas, who is able to escape his prison cell when a failed test of the captured naquadria disrupts the ship's force fields. Meanwhile, on the planet below, Kelownan, Tiranian, and Andari ambassadors have formed an uneasy alliance in the defense of their world as Anubis continues his destruction of the planet and his search for valuable antiquities. A crystal containing vital records of naquadria research is his likely prize, and Carter leads a search of a warehouse to recover the artifact. However, they are cut off by Anubis's Jaffa, and both they and the crystal are apprehended. 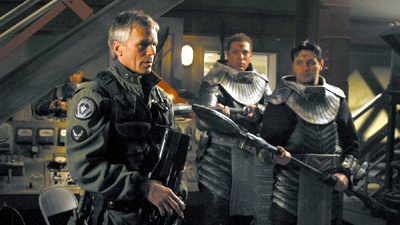 Jonas and Daniel escape from Anubis's mothership in time to rescue SG-1, however they learn that Commander Hale has betrayed his own planet in a deal with Anubis, and he demands the crystal as he turns SG-1 over to Herak for execution. Just then, Ba'al's fleet arrives and the battle for Kelowna begins. Anubis is defeated, but an escape pod enters hyperspace just before his mothership is destroyed. Kelowna has been saved, and Jonas prepares to bid farewell to the SGC. As he returns to Kelowna a hero, and Daniel remains to continue his work with SG-1, both have come home. Through the mind probe, Anubis has gained all the knowledge of Jonas Quinn, and he has taken the stockpile of naquadria from Kelowna. The Kelownans, Tiranians, and Andaris did go to war, and Kelowna used the naquadria bomb. The effects were devastating, but it brought the three powers to the table to negotiate a cease-fire. Jonas returns to Kelowna as the Kelownan representative of the new joint ruling council of the planet. Lord Yu is the oldest of the System Lords and has reached the point where he is unable to take another host.